Kathleen Bridge started her writing career working at the State News, the student newspaper of Michigan State University in East Lansing, Michigan. She is the author and photographer of an antique reference guide, Lithographed Paper Toys, Books, and Games, and the author of Revenge of the Sports Widows: How to Cope with a Sports Fanatic. She is a member of Sisters in Crime and has taught creative writing classes at the William Cullen Bryant Library in Roslyn, New York. 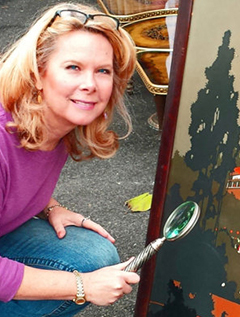 Kathleen is also an antiques dealer in Long Island, New York, and has contributed to Country Living magazine.